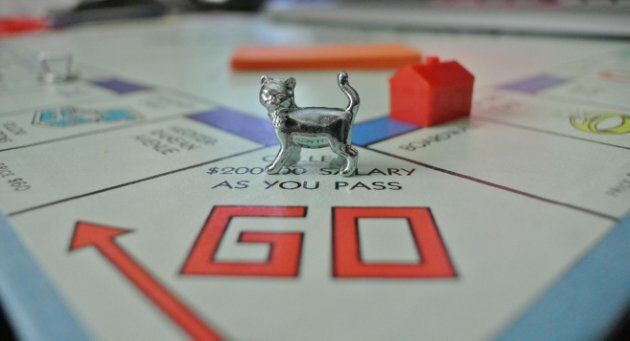 Monopoly fans, make room for your new house pet. Nearly seven months after winning a worldwide vote, the cat token is finally making its debut in the classic board game. Hasbro has officially begun rolling out the new gamepiece, which will permanently replace the iron token. In addition to being packaged in new Monopoly boxes, the cat will also be making a public appearance at the 2013 Internet Cat Video Festival at the Minnesota State Fair later today. The cat won the coveted spot in early February. Players were asked to choose between a cat, a helicopter, a diamond ring, a robot, and a guitar. Given the fact that Internet votes were accepted, it’s no big surprise that the cat won, capturing 31 percent of the vote. As for the iron, it ends an impressive 78-year run in the game (it was one of the original metal tokens in Monopoly). It almost managed to extend that run, as the boot and wheelbarrow were also at risk of being sent to game token jail. In the end, though, they managed to edge out a win among voters. While the change is bound to bum out some players, it’s not the first time Hasbro has monkeyed with the game pieces. When Monoply got its start in 1935, it only offered the iron, race car, thimble, shoe, top hat and battleship. The dog, wheelbarrow and since-retired man on horseback were added later, in the 1950s, replacing a lantern, purse and rocking horse. Other retired tokens include the cannon and the sack of money, which made its debut in 1999 after winning another player vote, though it was retired in 2007. The game has even had a few regionalized pieces in its history. An Australian edition of the game reportedly had a koala piece at one point, while a 2000 version of the game in Canada had a beaver token.